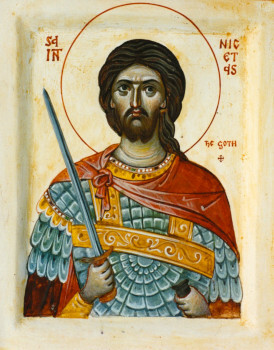 The Holy Great Martyr Nicetas was a Goth (a Germanic tribe). He was born and lived on the banks of the Danube River, and suffered for Christ in the year 372. The Christian faith was then already widely spread throughout the territory of the Goths. Saint Nicetas believed in Christ and accepted Baptism from the Gothic bishop Theophilus, a participant in the First Ecumenical Council. Pagan Goths began to oppose the spread of Christianity, which resulted in internecine strife. After the victory of Fritigern, heading a Christian army and inflicting defeat on the pagan Athanarik, the Christian faith began to spread increasingly among the Goths. Bishop Wulfil, the successor to Bishop Theophilus, created a Gothic alphabet and translated into the Gothic language many priestly books. Saint Nicetas worked intensely among his fellow Goths at spreading Christianity. By his personal example and inspired words he brought many pagans to the Christian faith. However, Athanarik after his defeat again contrived to gather his own forces, return to his own country and reestablish his former power. Having remained a pagan, he continued to hate Christians and persecute them. Saint Nicetas, having undergone many tortures, was thrown into a fire, where he died in the year 372. The friend of Saint Nicetas, a Christian named Marianus, by night retrieved the body of the martyr, unharmed by the fire and illumined by a miraculous light, and gave it over to burial in Cilicia. Afterwards it was transferred to Constantinople. Part of the relics of the Great Martyr Nicetas were later transferred to the monastery of Vysokie Dechany in Serbia.